The filter feeding Atyopsis moluccensis is one of the most interesting aquarium shrimp available in the hobby, courtesy of its unusual feeding method. Unlike most of their cousins, bamboo shrimp are not bottom feeders. They use fan-like appendages to filter particles out of the water. This calls for an entirely different feeding method, but luckily caring for these shrimp is not too hard if you know what you’re doing! Keep reading for everything you need about bamboo shrimp care and keeping bamboo shrimp in your own aquarium. Note: You can buy bamboo shrimp online here! Bamboo shrimp are naturally found in South-East Asia, where they inhabit fast flowing inland streams. With their reddish-brown color and creamy white back stripe, bamboo shrimp are a decorative addition to the aquarium. Their most striking feature, though, are the large feathery ‘fans’ used to filter particles out of the water. With a maximum size of around 4.7 inch/12 cm, these shrimp are significantly larger than dwarf shrimp. Females are larger than males and have smaller front legs. Although bamboo shrimp are relatively easy to keep, their feeding method does require the aquarist to take a few extra measures to ensure they don’t end up starving. Keep these shrimp in an aquarium of 20 gallons (76 L) or more and be sure to imitate their natural habitat by using a filter with a strong flow. A hillstream habitat would be ideal for this species. Provide a perch, like as a piece of tall wood or rock, in a high current spot so the shrimp can use it as a foraging location. Bamboo shrimp like to have access to a hide to stay in between feeding sessions. Additionally, like all shrimp, Atyopsis moluccensis regularly molt. They shed their exoskeleton to reveal a new one that has been forming underneath. Right after molting the new exoskeleton is still soft and the vulnerable shrimp will go into hiding for a few days until it has properly hardened. 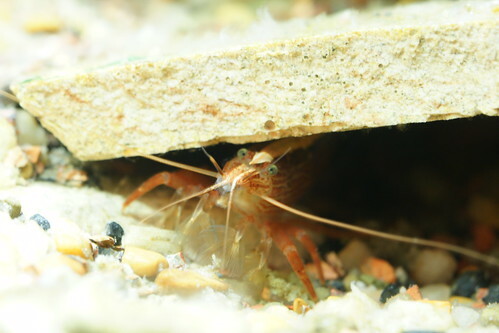 Be sure to provide an environment with plenty of hiding spots (such as shrimp flats) your shrimp can use as a ‘home’ and retreat to while molting. Because bamboo shrimp are extremely non-assertive as well as vulnerable, care should be taken to select tankmates that won’t harm them. This means no cichlids, Bettas or other carnivorous fish that would view them as prey. Peaceful species from this list and other harmless inverts such as dwarf shrimp and snails would make a better choice. Maybe even consider a single-species biotope aquarium if you really want to enjoy this species! Also be sure to always keep your bamboo shrimp in groups, as they appreciate safety in numbers. One of the more difficult aspects of bamboo shrimp care is their diet. These shrimp are filter feeders that can stand in the current almost motionlessly for hours on end, waiting for tiny particles to stick to their fans. A fascinating view, but it also means that a few special measures need to be taken if you don’t want your bamboo shrimp to go hungry. You can target feed these shrimp by releasing (powdered) food just upstream so it flows right into their fans. They are omnivorous and will appreciate anything they can catch: baby shrimp food, algae powder, crushed fish flakes, baby brine shrimp, anything works. In addition to powdered food, many aquarists like to simply squeeze their filter sponge into the tank. This releases a cloud of particles that bamboo shrimp will absolutely love to feed on. Only do this if you’ve got a stable cycle running in your tank, though! A healthy bamboo shrimp should spend most of its time filtering. Are you seeing your bamboo shrimp attempting to scrape food off the substrate using their delicate fans? This is a serious indication that it’s definitely time to increase feedings! If you find your aquarium is getting dirty quickly with all that powdered food floating around, try keeping a bottom ‘cleaning crew’ to deal with the particles your bamboo shrimp miss. Amano shrimp work well for this and will cohabit peacefully with Atyopsis. Although breeding bamboo shrimp is possible, it’s a real challenge. Like Amano shrimp (and unlike the easier dwarf shrimp), they don’t hatch as miniature adults but pass through a larval stage during which they require brackish water to survive. This means the larvae should quickly be transferred to brackish water (sources report 33 or 34 grams of salt per liter) after hatching and then stay there until they turn into actual shrimp. After this, the fry need to be returned to fresh water. Not an easy task, but definitely something to look into as almost all bamboo shrimp in aquarium stores are wild caught. Although they are not as common as dwarf shrimp, you should be able to find bamboo shrimp at some aquarium stores. Don’t confuse them with their other filter feeding cousin, though. Vampire shrimp (Atya gabonensis) can be recognized by its blueish exoskeleton and larger size. Green lace shrimp (Atyopsis pilipes), on the other hand, are smaller and less commonly available. A few missing limbs are not much of a problem, as these can be regrown over the next few molts. Do look for shrimp that are actively foraging and seem healthy and active. You can also buy bamboo shrimp online here! If you have any more questions about Atyopsis moluccensis or want to share your own experiences with this fascinating shrimp species, don’t hesitate to leave a comment below! Cover photo: DSC_0317 by cahalane (CC BY-NC-ND 2.0, original). I should add that Woody had no problems or visible damage after picking for food on the bottom. Also,although I have never read about it from any other sources, I have observed my neocaridina shrimp actively fan-feeding in the filter flow as well! Perhaps if they can do both that and raking the bottom without injury or issue, the larger species can as well? 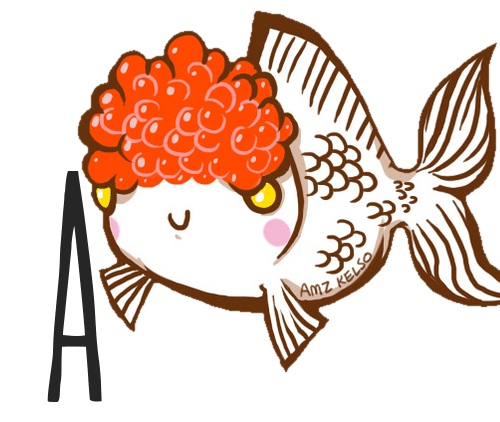 I had one of these fellows for a short time before he decided to evacuate the aquarium one night… it was sad to find him a week later, but these things happen. So, an important point – as with most shrimp, keep a tight lid on the aquarium! I had Woody in two aquarium setups. The first was a 20 gallon tank with a lot of rockwork and a few plants. I didn’t see him very often in this setup, and I assume that he mostly stayed hidden in or on the backside of rocks, coming out at night to feed. When I moved my setup into a larger 35 gallon tank however, he would be out and about any time you looked! This tank had lots of branches and driftwood in it, and I’ll assume that the “wood” part of “wood shrimp” is a strong indicator as to how they prefer their environment! He was able to camouflage himself by hugging tight to branches, and seemed to divide his time between hanging out in the filter flow and hiding or resting away from the moving water. Tankmates included apple snails and platies, which were fine, and a betta for a short period of time, during which he remained hidden during the day. There is a lot of information stating that it’s bad for these shrimp to rake the gravel, but I found when I first introduced him to my tank, despite there being plenty of “floaters” present, he would cheerfully pluck at detritus on the sand bed, carving a swathe of clean sand across the bottom and leaving a trail of tiny round poops as he went. My recommendations for keeping this shrimp are: Lots of wood and branches to help it feel secure during the day, a strong current (if you can side-mount your filter output you’ll be able to observe much more wood shrimp action), a mature tank of at least 30 gallons (they are extremely efficient fan-feeders), and a team of smaller shrimp or substrate-sifting fish to kick up a constant stream of edible bits into the water column. As for the fans being damaged by foraging on the ground, I have seen fan shrimp with damaged fans at aquarium stores. It might have something to do with the type of substrate, you mention sand – they were always on sharp gravel.